Knee pain is a common symptom in people of all ages. It may start suddenly, often after an injury or exercise. Knee pain also may begin as a mild discomfort, then slowly get worse. Knee pain can have different causes. Being overweight puts you at greater risk for knee problems. Overusing your knee can trigger knee problems that cause pain. If you have a history of arthritis, it could also cause knee pain. Arthritis. Including rheumatoid arthritis, osteoarthritis, lupus, and gout. Baker cyst. A fluid-filled swelling behind the knee that may occur with swelling (inflammation) from other causes, like arthritis. Cancers that either spread to your bones or begin in the bones. Infection in the bones of the knee. Infection in the knee joint. Bursitis. Inflammation from repeated pressure on the knee, such as kneeling for a long time, overuse, or injury. Fracture of the kneecap or other bones. Iliotibial band syndrome. Injury to the thick band that runs from your hip to the outside of your knee. Pain in the front of your knee around the kneecap. Torn ligament. An anterior cruciate ligament (ACL) injury, or medial collateral ligament (MCL) injury may cause bleeding into your knee, swelling, or an unstable knee. Torn cartilage (a meniscus tear). 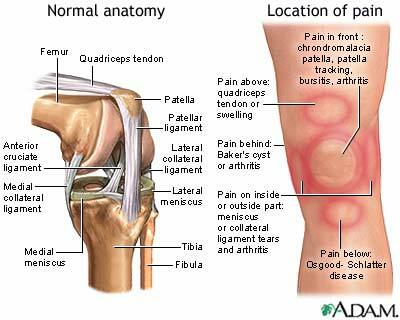 Pain felt on the inside or outside of the knee joint. Strain or sprain. Minor injuries to the ligaments caused by sudden or unnatural twisting. Simple causes of knee pain often clear up on their own while you take steps to manage your symptoms. If knee pain is caused by an accident or injury, you should contact your health care provider. Rest and avoid activities that cause pain. Avoid putting weight on your knee. Apply ice. First, apply it every hour for up to 15 minutes. After the first day, apply it at least 4 times per day. Cover your knee with a towel before applying ice. DO NOT fall asleep while using ice. You can leave it on too long and get frostbite. Keep your knee raised as much as possible to bring down any swelling. Wear an elastic bandage or elastic sleeve, which you can buy at most pharmacies. This may reduce swelling and provide support. Take ibuprofen (Motrin) or naproxyn (Aleve) for pain and swelling. Acetaminophen (Tylenol) can help relieve pain, but not swelling. Talk to your provider before taking these medicines if you have medical problems, or if you have taken them for more than a day or two. Sleep with a pillow underneath or between your knees. Always warm up before exercising and cool down after exercising. Stretch the muscles in the front of your thigh (quadriceps) and in the back of your thigh (hamstrings). Avoid running down hills -- walk down instead. Bicycle, or better yet, swim instead of run. Reduce the amount of exercise you do. Run on a smooth, soft surface, such as a track, instead of on cement or pavement. Lose weight if you are overweight. Every pound (0.5 kilogram) that you are overweight puts about 5 extra pounds (2.25 kilograms) of pressure on your kneecap when you go up and down stairs. Ask your provider for help losing weight. If you have flat feet, try special shoe inserts and arch supports (orthotics). Make sure your running shoes are well made, fit well, and have good cushioning. Further steps for you to take may depend on the cause of your knee pain. Your provider will perform a physical exam, and look at your knees, hips, legs, and other joints. Your provider may inject a steroid into your knee to reduce pain and inflammation. You may need to learn stretching and strengthening exercises. You also may need to see a podiatrist to be fitted for orthotics. In some cases, you may need surgery. Huddleston JI, Goodman S. Hip and knee pain. In: Firestein GS, Budd RC, Gabriel SE, McInnes IB, O'Dell JR, eds. Kelley and Firestein's Textbook of Rheumatology. 10th ed. Philadelphia, PA: Elsevier; 2017:chap 48. McCoy BW, Hussain WM, Griesser MJ, Parker RD. Patellofemoral pain. In: Miller MD, Thompson SR, eds. DeLee and Drez's Orthopaedic Sports Medicine. 4th ed. Philadelphia, PA: Elsevier Saunders; 2015:chap 105. Niska JA, Petrigliano FA, McAllister DR. Anterior cruciate ligament injuries (including revision). In: Miller MD, Thompson SR, eds. DeLee and Drez's Orthopaedic Sports Medicine. 4th ed. Philadelphia, PA: Elsevier Saunders; 2015:chap 98.